Arsenal’s defensive troubles are well known, and it is clear that they will need to dive into the summer transfer market to get some solid defenders who could come in and help them challenge the top clubs in the Premier League. According to the latest reports from Metro, the Gunners have identified Ivory Coast defender Jean-Philippe Gbamin as their top summer target. The defender currently plies his trade in the Bundesliga for Mainz and is being valued at £40m. The same report adds that the fee could be a problem for Unai Emery and it is believed that the board is going to hand him a transfer budget of £45m in the summer. However, if the defender wants to leave the club in the summer, then Mainz might be forced to reduce their valuation of the player. 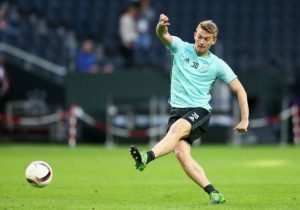 The 23-year-old has played in 21 games in all competitions for Mainz this season and has become a crucial member of their squad. Arsenal have currently got the worst defensive record among any of the top eight clubs in the English top-flight, and that is the biggest reason why they now find themselves outside of the top four. Shkodran Mustafi and Sokratis Papastathopoulos have often been error-prone this season. Moreover, they have also made some bad decisions at critical junctures, and it is clear that the defence has been Arsenal’s Achilles heel so far in this campaign. Laurent Koscielny has returned from injury and has done relatively well at the back, but given his injury track record, Emery cannot rely on him for the entire season. Gbamin will add a lot more pace to the Gunners backline, and his versatility will also be handy for the manager as the 23-year-old can turn out as a defensive midfielder as well when required. He is excellent on the ball and can pick out a pass or two from the back which makes him so useful as a midfielder. We are moving to an era where managers want their defenders to be more productive on the ball instead of being old fashioned and hacking the ball away at every chance they get. Therefore someone like Gbamin can be a crucial player in Emery’s setup if they manage to land him in the summer. 4-3-3 Liverpool Predicted Lineup Vs Arsenal: Sadio Mane To Be Back In Action? Arsenal Eyeing A Swoop For Manchester United Veteran: Great Move For All Parties Involved? 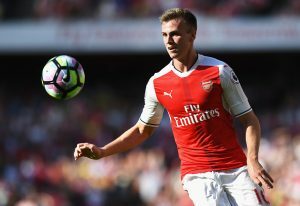 22 Y/O English Defender Pens New Deal At Arsenal: Does He Have A Future At The Emirates?